Party all night on Halloween!!! There will be scare fun galore as Gourmet Town in Mihama kicks off its annual Halloween party Friday. The group of different restaurants that form the Gourmet Town will do their outmost to cater a truly memorable event starting at 5 p.m. and going on until 5 a.m. The seating is both out and indoors, and patrons can choose from Japanese, American, Italian, Okinawan and Chinese dishes according to their palate. 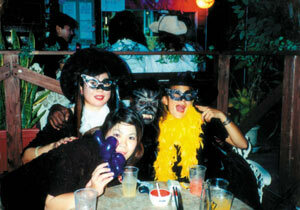 For those who dress appropriately in a Halloween costume, the cost is only $15 for all beer, cocktails, sake or soft drinks they wish to consume during no less that eight hours of party time. The best costume will also receive a special prize. Gourmet Town is located in Mihama near the Ferris Wheel building across the parking lot from Jusco Department Store. For more information, call Gourmet Town at 098-936-9306. If you’re looking to dance the night away this Halloween, the nightclubs are bound to be hopping! Several clubs are holding parties on October 31, and others are hosting parties on Nov. 1 to prolong the festivities! If you enjoy the intensity of techno, trance, and hardhouse music, you won’t want to miss the CROSSOVeR Halloween Party on October 31 at Club 3F in Mihama. DJ Shinkawa, one of all of Japan’s most influential and experienced DJs will be spinning with other mainland CROSSOVeR resident djs as well as Okinawan djs Naogee, Kunihiro, Tomohiro, and Hikaru. 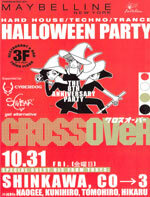 CROSSOVeR has been one of Tokyo’s hottest parties for a long time and has recently celebrated its 8th anniversary! If you want to hear some of the hottest djs play at one of Okinawa’s most well-known clubs, check out CROSSOVeR at Club 3F this weekend. Admission is Y3,000 at the door, Y2,500 if you bring a flyer, or Y2,000 if you wear a costume. Admission includes one free drink. The party kicks off at 9 p.m. For more information on DJ Shinkawa, check out www.djshinkawa.com. 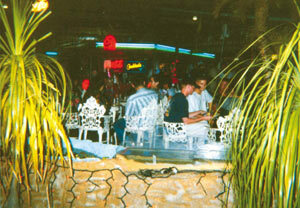 If you are into other genres of music but still want to hit up Okinawa’s club scene, don’t fret. There are enough parties taking place this Halloween to keep you busy all night. Depending on your location (and your budget), you could easily bounce from club to club and dance until dawn. Here is a list of the other parties taking place. For driving directions or club and event information, check out Okinawa’s #1 Party Resource, GrooveSeeker, at www.gsv2.com with your PC or mobile phone. Featuring: Lady’s Night. DJ Fukuda. Admission: Men ¥1500 w/ 2 drinks, Ladies FREE!! !